Spent the last couple of days in a funk. Felt unmotivated and lethartic. Even passed on a trip to NOLa for JazzFest. This is all quite unsual for me. Fell asleep quite early last night. And slept almost 14 hours! Definately not normal. But I felt much better today. Was I just run down? Maybe. I felt fine today. So... let's ride as planned! Today's selection is a road ride. Tempo pace, in the new (higher) zone. I head out bound on a mostly out-and-back route with a slight tail wind. Constantly reminding myself, don't burn it all. Riding back will be harder. I took a new route through the Spring Branch neighborhood, that avoids much of the Memorial Villages. I like this route better. In the Villages you have to ride the sidewalks. City ordinance. Ichk. 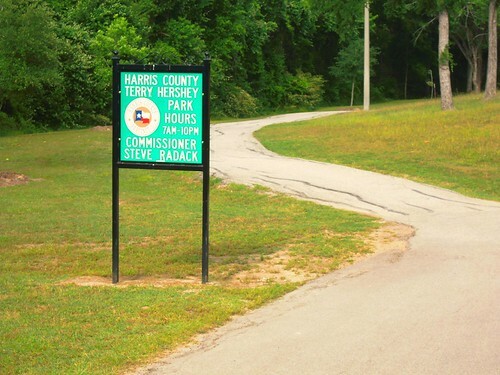 I make it out to Barker Reservoir, and take the bike path around to Barker Cypress, spin around and head back. The wind's channeled along the levee, and gives a free boost. Fun! 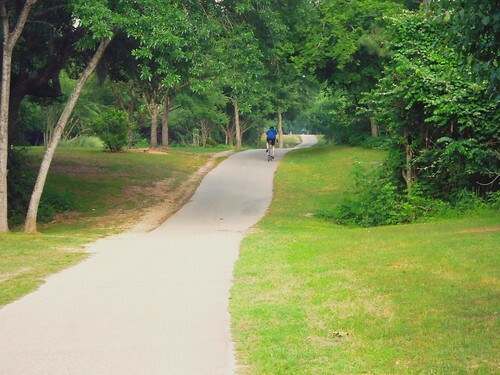 On my return route I decide to take the trail through Terry Hershey Park. I'm quite apprehensive about this. 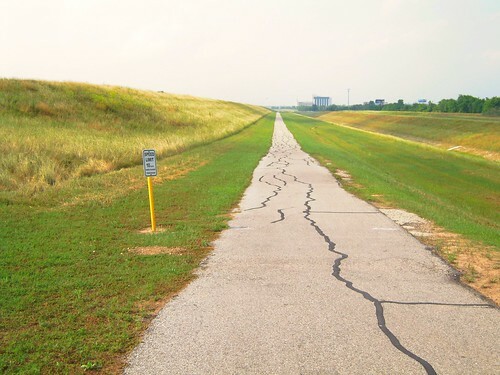 I'm not superstitious, but it seems every time I take this route something bad happens. On this trail I have */broken a chian */suffered a ride with three flats */and broken my elbow. How could anyone break their elbow on this? Fooling with the cell phone! At almost the exact point where I fell... my phone rings. I didn't even consider answering it, even though I suspected it was someone I wanted to talk to! Bad Karma. True to form, there is a slightly negative experience. As I near the Beltway I discover the trail closed. And ripped up. Unrideable. It's a long walk. So I end up sneaking through a nearby neighborhood. Getting quite disoriented on cul-de-sac streets. "Just follow the Garmin" I remind myself, convinced I'm going the wrong way. I make it back to known territory and polish off the ride with a nice upwind effort back home. A quick ice bath, snack, and bed. What will tomorrow bring?